The "Reigning" Icon of The Mother of God is not well-known outside Russian Orthodox circles, yet it is of great historical importance. It was found on the same day on which the last Csar, Nicholas 11, abdicated the throne (March 2 1917). When the icon became known Orthodox believers understood that the care of Russia had passed to the Mother of God. The story of its discovery is like the stories connected with other famous icons. On February 13, 1917, Our Lady appeared to a peasant girl called Eudocia Adrianova and spoke these words: "There is a large, dark icon in the village of Kolomenskoe. It must be taken from there; the people must pray". Later, in a second dream, the girl saw a white church and the figure of a majestic lady inside it. Eudocia decided to search for the church and on March 2, in the village of Kolomenskoe, not far from Moscow, she found the Church of the Ascension. She told the priest about her dream and the icon. They searched the church, but it was only when they went into the basement that they found a large, dark, icon of The Mother of God. The girl recognised the icon. The icon was hung in the church and quickly came to be reagrded as miraculous. Many copies were made (The photo above is of a copy. The one below is of the original.) and it found its way into many villages, churches, monasteries and even factories throughout the Moscow area. The Theotokos is represented as the Queen of Heaven and Earth. She is dressed in a green gown and a red mantle. She sits on a throne and carries a sceptre in her right hand, her left hand resting on an orb. On her head is a crown circled by a golden halo. The Infant Jesus sits on her knees, His right hand raised in blessing, His left hand pointing to the orb. One of the phenomena associated with the icon concerns the red mantle. Although it was obviously dusted and carefully cleaned, no paint was applied to the original icon and yet the mantle became redder after the death of the Csar and his family. In iconography the colour red means passion, love, life and suffering, and is commonly used as a sign of the Resurrection - the triumph over death. The redness of Our Lady's mantle suggests that she has taken on the sufferings of Russia and, because it is an icon, this promises a "resurrection" through the intercession of the Mother of Christ. It is thought that the icon, painted in the 18th century, was earlier placed in the Ascension Convent of the Kremlin. It was taken from there to Kolomenskoe during the Napoleonic invasion of 1812. After the Bolshevik Revolution in 1917, the village church was closed, and the icon, along with other holy objects, was taken to the storage rooms of the State Historical Museum where it remained for seventy years. 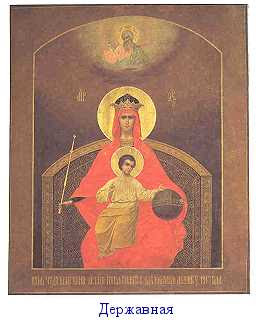 At the end of the 1980's the icon was quietly removed from the Museum and taken to the publishing house of the Moscow Patriarchate. There it remained for several years in the altar of the house church dedicated to St. Joseph of Volokolamsk. On July 27, 1990, at the blessing of the newly elected Patriarch of Moscow and All Russia, His Holiness Alexei, Orthodox clergy and faithful of Moscow carried the icon in procession to Kolomenskoe and placed it in the Church of Our Lady of Kazan which was not closed. Since that time, every Sunday, the akathist hymn which had been especially composed in honour of the icon has been read before the miraculous image of The "Reigning" Mother of God.